Happy Passover to all of our Jewish bloggers and readers! 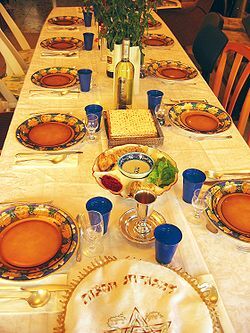 We had our Seder on the third night with friends and it was an amazing meal. There has been a long suspicion that I married a Jewish girl because of a notorious addiction to Matzo ball soup. Leslie just happens to be a world class cook. She spent days preparing for this meal and is and her home-made broth and Matzo balls were the best that I ever had. (I was allowed to baste the brisket through the day, but that is the closest that she would let me get to the preparation of the meal). The rest of the meal was equally amazing with slow cooked Brisket, Apple & Almond Haroset, apple kugel, sautéed French green beans, Kale salad, and a lovely wine. She also had chopped liver and Gefilte fish which I have never been able to stomach. Now, we get to go on to Easter since my kids gets to double dip on both Jewish and Christian holidays. I love April. Best wishes to all of our Jewish members! I would ask for recipes, but if it can’t be cooked in the microwave, my wife won’t fix it. 🙂 And she controls the cooking, using some flimsy excuse about me needing to be on a healthy diet. Which Passover are we celebrating: Abraham’s; Hebrews’ Exdous of Egypt; or Jesus’ sacrifice? Happy Spring to all our Freethought members. May you enjoy food and companionship with your favorite friends and relatives and may all be tolerant and understanding of variations in traditional and new ways of doing things. L’chaim. I always look forward to Passover because it is easier to find those mini macaroons made by Manischevitz. They’re not as good as bakery macaroons but they keep better. And, they’re bite sized! I am happy to hear that your wife Leslie carries on the Jewish tradition of Passover in your home. Happy Passover to everyone of the Jewish faith! Happy Passover! There is no better dumpling than a Matzah Ball. As good as the food. (and I am envious of what you described of Leslie’s cooking) I imagine the conversation to be a highlight. The joy of Pesach for me is discussions of the meaning in today’s world. May we come to your house next year?! (My middle name is Leslie if that gives me an in.) Chag Sameach & a joyous Easter.